After earning a degree in applied math and statistics at the California State University campus east of Los Angeles, she worked for a year as an Americorps math tutor at Summit Tahoma, a small San Jose high school that’s part of the 11-school Summit Public Schools charter network. That in turn led her to become one of 21 participants in the inaugural year of Summit’s teacher residency program, which is authorized to train and credential new teachers by the California Commission on Teacher Credentialing. Teacher residency programs, which are modeled on medical residencies, are growing in popularity as a way to improve teacher effectiveness. Future teachers learn the craft by working for a year with experienced teachers, who provide guidance, feedback and support. But Summit’s program is the first of its kind to prepare teachers to lead classrooms structured around personalized learning, said Pam Lamcke, director of the program. Personalized learning enables students to learn academic content at their own pace, moving on when they show mastery of material in a variety of content areas. A pioneer in personalized learning, Summit developed its online Summit Learning Platform with help from Facebook engineers. Students choose how to learn from playlists of videos, animations, exercises and texts. Teachers “facilitate,” but let students take the lead. For most of the school day, students work on projects, individually and in groups. The goal is for students to become self-directed learners. The 24-year-old Alatorre spent the past school year observing, assisting and teaching alongside an experienced teacher at Summit Tahoma, one of the charter network’s San Jose high schools. She also completed coursework on teaching methods. All 21 residents, including Alatorre, earned their credentials and were offered full-time teaching jobs at Summit for the coming year. Eighteen have accepted. Alatorre will teach Math II to sophomores at Summit Tahoma. The residency program doesn’t just address teacher shortages in key subject areas; it will also help build diversity in the teaching force at Summit and beyond, said Lamcke. A majority of the participants in the program this year were people of color, primarily Latino. In its inaugural year, the teacher residency program was offered free of charge — along with a stipend to help participants cover living expenses. Starting with the second cohort during the coming year, all teacher residents will receive a $20,000 stipend. Out of that, they will pay $10,000 if they want to earn a teaching credential and $18,000 if they want to earn a master’s degree, which will be awarded by the Stockton-based University of the Pacific. Those seeking a master’s will be eligible for federal or state student financial aid to cover their costs. The Teacher Residency: An Innovative Model for Preparing Teachers, Learning Policy Institute, 2016. During her residency at Summit Tahoma, Alatorre worked under the guidance of Justin Nordheim, who has been teaching for four years. He teaches Math III, a Common Core-aligned mix of algebra, “a dip into trig,” pre-calculus and statistics, to 11th-graders. The two of them planned lessons together, which forced them to justify to each other their instructional choices. Even Nordheim found that a valuable exercise. “Without the need to explain to someone else, I don’t think through the purpose and ask why I’m doing what I’m doing (in the classroom),” he said. In the second semester, Alatorre became the lead teacher for two math classes, while Nordheim provided feedback and support. Summit’s personalized and project-based learning model is “still being developed,” Nordheim acknowledged. “Teachers are on the front lines of figuring out” how to improve the online learning platform and make it work. On a morning this spring, Alatorre asked Math III students to discuss with a table mate how they make buying decisions online. Then she handed to each student a print-out of his or her “learning profile,” which shows scores for each math concept studied during the year. “Look at the data and decide what you’ll do to raise your average,” she said. Students discussed strategies with their table mates. Alatorre didn’t just want students to learn to analyze data. She wanted them to take charge of their learning. “The lesson is about figuring out what they want to change,” she said. That’s the core of Summit’s model. Students can use Summit’s online platform to review concepts they didn’t fully understand. When they are ready, they can take a new quiz, and if they show a higher level of mastery they can raise their end-of-the-year grade. Because Summit doesn’t give mid-year grades, students have time to improve their grades. While students can work at their own pace using the online platform, teachers keep a close eye on students who fall behind, Nordheim said. The school day includes time for an “intervention class” for students who need more help to catch up. In 2017-18, residents spent four days a week at one of Summit’s Bay Area schools. In the coming year, some will work at district schools in the area that use Summit’s model. On Fridays, all teachers in training gather at a Milpitas office to work through a project-based, self-directed curriculum designed in collaboration with the Stanford Center for Assessment, Learning and Equity (SCALE). As part of the credentialing process, independent evaluators assess videos of their teaching and judge their ability to write lesson plans, choose instructional materials, design student assessments and analyze data. 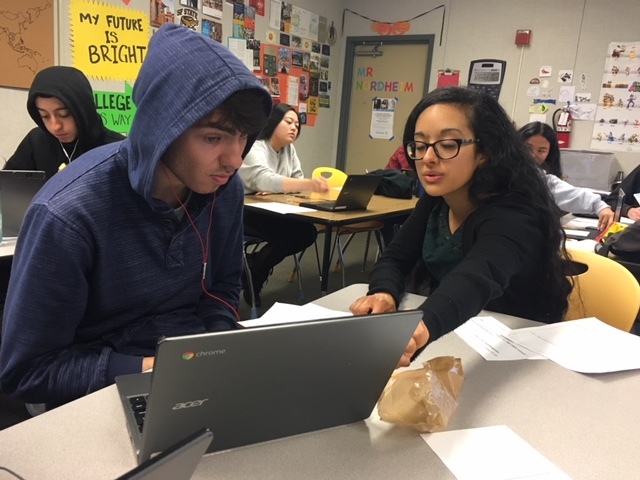 “The Summit model prepares students to be self-directed, but there are growing pains,” said Marcelo Quiroz, who worked with an AP Environmental Science teacher at Summit Rainier, another San Jose high school. After earning a degree in molecular biology at UC Santa Cruz, Quiroz worked as a data analyst for a high-tech company. However, the job didn’t satisfy him. “I missed biology,” he said. Now, he’s excited about sharing his “passion” for science with his students. In the fall, he’ll teach biology at Summit’s Tahoma campus. Like some of her students, Dina Le speaks English as a second language, though she switched from Vietnamese to English at an early age. She earned an English and American Studies major at the University of Southern California, then pursued teaching to share her “passion” for literature. In the fall, she’ll return to Summit Tahoma, where she previously tutored students, to teach Advanced Placement English. Fifty aspiring teachers will make up the second group of teacher residents. Some will work at traditional public schools in the Bay Area that are using Summit’s personalized-learning model. Summit is offering its online learning platform and model, along with training, tech support and mentoring, at no charge to interested schools. Some 330 schools nationwide — 70 percent are traditional public schools — are Summit Learning Program partners this school year with more expected in 2018-19. Funding from the Chan-Zuckerberg Initiative, created by Facebook founder Mark Zuckerberg and his wife Priscilla Chan, supports the program. This is the second part of a two-part series on personalized learning at the Summit charter school network. For Part I, go here. “Personalized Learning” is code — in education contexts “personalized learning” is code for technological data mining and exploiting children as profit nuggets by machines for large businesses. It is part of the philosophy that the ‘free market’ is right “market” for public education. “Personalized Learning” reduces human contact and social relationships, most hurtfully less learning with a human teacher. Taking away human contact is a sad fate for all students, particularly trauma-impacted children.